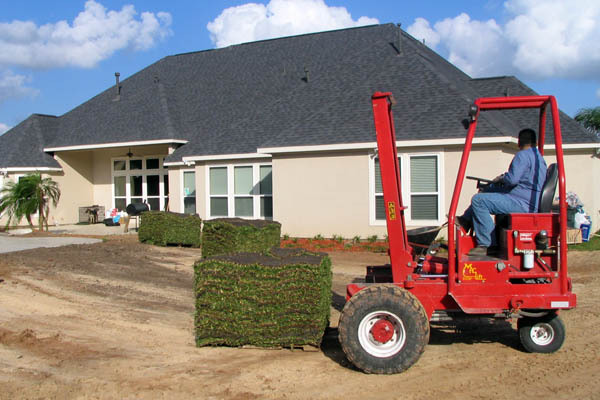 If you need grass sod specially developed to thrive in the demanding climates of Texas, please give us a call at 1-800-753-5182 or 1-979-244-2496. What is brown patch and what can I do to prevent it? Brown Patch is a disease, which is most prevalent during the period of time when our day-time temperature is beginning the transformation from summer to fall. This disease develops from a soil born spore and it's most defining characteristic is an almost perfect circle with a gold ring around the edge. The three contributing factors to brown patch development are cooler temperatures, an abundance of moisture and also an abundance of nitrogen fertilizer. We have no control of temperature therefore we must concentrate on the other two. 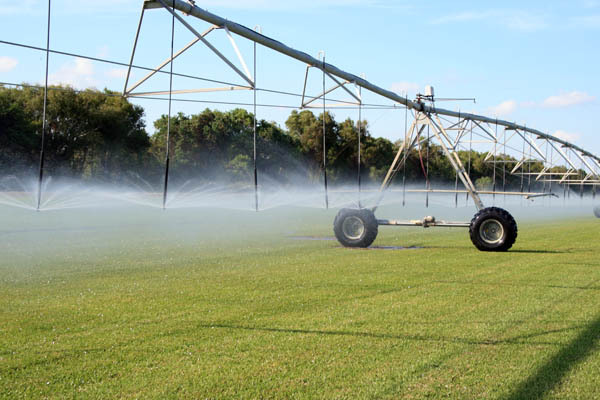 You should limit your supplemental irrigation to only when necessary. In the fall most grasses can go up to two or three weeks without rain before stress occurs. You should not apply any fall fertilizer until the cooler temperature transition is complete. When you do apply your fertilizer be sure it has a limited amount of nitrogen in it. What can I do if my grass develops Brown Patch? The first thing we must remember is that we have to limit any supplemental irrigation to only the very minimum. This should be 1" of moisture every 2 to 3 weeks. If you can push your finger into the soil below the grass it does not need any irrigation. Do not make a fertilizer application of any type during periods of Brown Patch development. You may need to make an application of fungicide to help halt the development of this disease. Consult your local nurseryman for the recommended product for your area. However, these products are designed more for prevention than as a cure. Ideally, you should make an application of fungicide just prior to the passage of the first cool front of the season. This will serve as a preventative and you will have much better results controlling this disease. In most areas of Texas grass is planted year round. This process has been done this way for many years and only during periods of extreme cold, where we experience ground freezing would you expect damage to your new lawn. There are however certain management practices you should follow to insure the survival of your new lawn. The first and most important is adequate moisture. Many people feel that because grass is brown and dormant that it doesn't need moisture. One must remember that the plant is dormant and not dead. The grass will still require 1" of moisture every 2 to 3 weeks during this period. This should be achieved by rainfall or supplemental irrigation. Another good practice for newly established lawns would be to water thoroughly just prior to periods of extreme cold. This moisture will help insulate the roots and growth points in the lawn. The cooler periods of the year are really good times of the year to plant grass because they will require less water for establishment. I want to plant grass under my shade trees. What is the best method of doing this? The first rule of thumb that must be applied to this situation is do I have enough sunlight for grass survival? There has to be at least 3 to 4 hours of direct sunlight with filtered sun during the day for even the most shade tolerant warm season grasses to survive. This may be achieved by raising the canopy of your trees and thinning the canopy out will allow more filtered sun during the day. You may plant grass under less favorable conditions and it will survive one or two seasons, but it will begin to thin out after this. 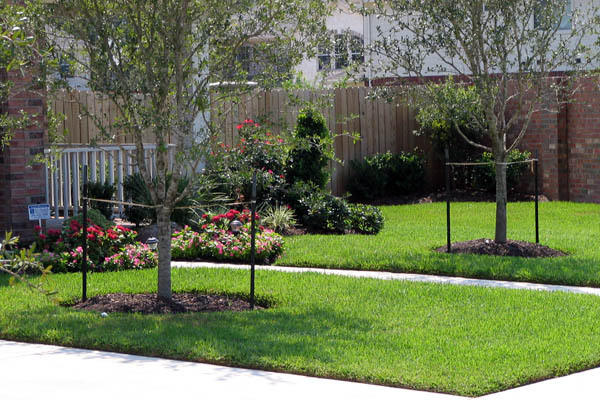 The most shade tolerant warm season grass is St. Augustine. The most shade tolerant variety of St. Augustine that we have found is Palmetto St. Augustine. These are the steps we recommend when establishing grass in shade areas. First, remove all the debris from the area to be planted. Sticks and leaves left on site will create air pockets under the sod and hinder root development. Next, till up the area to be planted in order to break up the hard surface which has formed. Be careful not to damage any exposed tree roots. Apply a maximum of 2 inches of good topsoil evenly across the area to be planted. Never cover exposed roots with soil as this may damage the tree. Be sure the area is level and free of any large clumps. You are now ready to plant. Plant only top quality sod from a reputable dealer for best results. Remember, cheaper is not always better. After laying your grass immediately water it thoroughly. 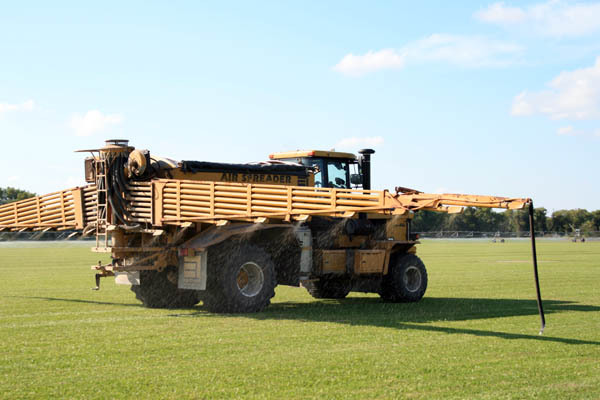 This will seal the blocks of grass to the topsoil. Do not continue to water this area frequently. This will damage the sod as well as the grass. Test the soil under the grass with your finger. When this soil is still moist to the touch it does not need water. Only water when it becomes firm to your finger. My grass is brown in the winter. What should I do during this period? Your grass is dormant, not dead. It still requires a certain amount of inputs to maintain a healthy plant so it will survive what winter brings and come out vibrant in the spring. Grass still requires a certain amount of moisture during dormant months. Most winter damage is done to grass when it is moisture stresses. During the winter and early spring your grass will require a minimum of 1 inch of moisture every three weeks. If this amount is not achieved with rainfall use supplemental irrigation. A fertilizer application high in phosphates and potash will also help maintain a healthy root system during the dormant period. This application should be made prior to dormancy to allow the plant to take up these nutrients. We do not recommend an application of pre-emergent herbicides during this time due to the fact that this could do damage to the root system.